After an extremely frustrating session of fumbling, mistakes, and general brainlessness, I finally made some progress on my massive fannish project today. I might have the beadwork done in time to baste this sucker onto the back of my denim jacket to wear to the opening next Friday. I may have to do some fast faking with the remaining pattern to minimize the effect. The Serenity Coat, however, is going to take me till the London convention (mid-November) to finish. 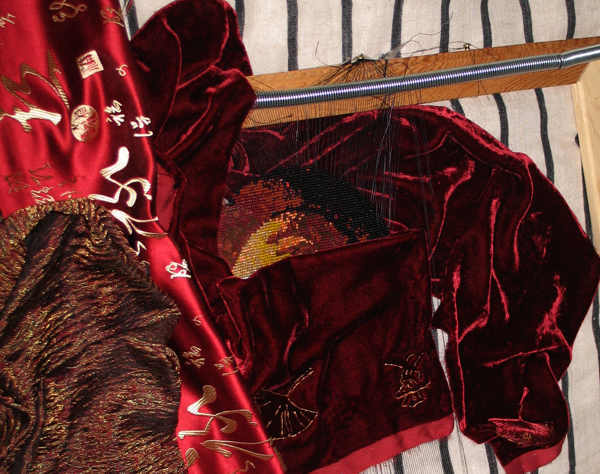 It has morphed in concept from Mal to Inara--from brown leather to silk and velvet. 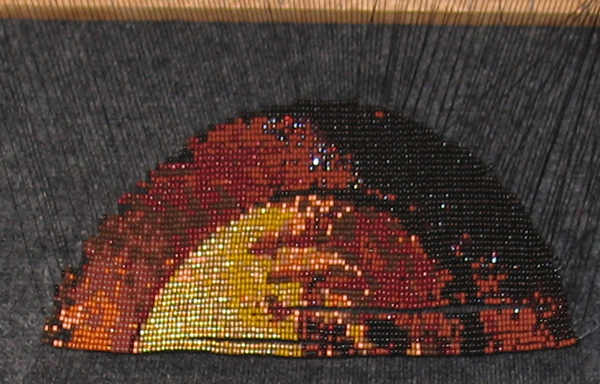 If you look closely, you can make out the beadwork hidden in there. So. What do you think so far? Wow. I love the beadwork, and the colors for the coat are just gorgeous. You are so creative! Thanks! There's a huge gulf between buying bits of pretty, pretty fabric and actually making something wearable. We'll see how it goes. Well, you've made a pretty good start to leaping that gulf! I wish I had your attention to detail and patience - I have about six half-finished cross-stitch projects that can attest to my lack of both! UFOs: the bane of every creative person's existence. I love that beadwork. It's so pretty. It shows that you're working on something you love. I do sort of love Serenity. Beyond what's reasonable. Especially for a movie. It is a weird thing. I love that you've combined two things you love. Gorgeous gorgeous gorgeous. I can't wait to see it when it's done. Thanks! You and me both, man. I'm really torn between making the coat to fit me, and making it for someone young and pretty. Either way, I'm looking forward to seeing the finished product. You are neither old nor tough to look at. In fact, I think you are lovely, inside and out. I'm smart about this kinda stuff, so you can trust me. Aw, thanks, sweetie! That's real nice of you. I'm thinking more of the prospect of having the coat photographed, however. Can't stand to see any sort of picture of any part of myself. But I'd like to see pictures of the coat at the con. Yeah. I do understand. I saw some pics of me online from the Austin shindig and I was all, "eep". Yeah, because being photographed from behind is always better than seeing yourself from in front. Nope, I'm thinking "pretty young woman" is my best solution. Wow! you are so very very cool! I'm in awe! I've never heard patience described as one of the cool virtues, so...Cool! Thanks! The coat with the beading is going to look absolutely amazing. Wow. Thanks! I sure hope you're right. Your icon is gorgeous! I see "Zen Fen" icons around from time to time--what does it refer to? lanning used to make them. I don't know if she still does. She called it icon therapy. Gorgeous. And you sew as well? Too Damn Talented! Ah yes. I have many useful domestic virtues. Growing up extra tall, I had to learn to sew or else wear highwater pants. I'm also pretty handy with a glue gun.